This pvc plastic rail slips snugly over the top edge of 1/2", 5/8" or 3/4" drawer sides to allow for hanging files. Select appropriate length for your needs and then type in size to within 1/8" of cut length. Example: If you need a pair that is 23-1/2" long, then select the 24" length and then input 23-1/2 or 23.5 for the "Cut To?" 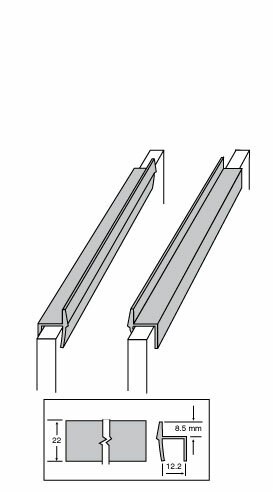 If you need rails longer than 24", then you must select the 48" length as stock for your cut. Also available in uncut 24" and 48" lengths.